How do I get a dongle? How to use USB modem stick (dongle) if my PC does not have any open USB port? Is USB modem stick different from dongle? How much speeds can mobile broadbnd USB dongle offer? I am a MAC user? Do dongles support MAC OS? Which mobile broadband providers offer mobile broadband dongles (USB modem sticks) in UK? Is USB dongle free with these packages? Can I use my usb mobile dongle abroad? Should I have to buy new dongle when I switch my mobile broadband providers?How to install my mobile internet dongle? How to improve the speeds of my dongle? 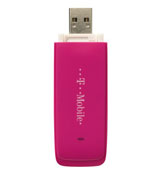 Mobile broadband USB dongle is a plug and go device connected to a USB port of laptops to provide broadband internet access within 3G or WiMAX networks. It is easy to use mobile broadband this way as you can work at home or on the move just by plugging into the USB port on your netbook, PC or laptop. You do not need a phone line to use mobile broadband via dongles meaning there is no line rental such as with ADSL type broadband. Despite 3G mobile broadband network has a wider coverage in UK (90%), you would need to check the coverage of your mobile ISP in the areas you will be using this kind of broadband connection just as some areas in rural and remote locations may not have coverage. Dongles or USB modem sticks offer better mobility, freedom and all the convenience you would need on the move. You can access 3G mobile broadband to send emails, surf the net and watch the online videos. Mostly you need not buy dongle as mobile broadband providers in UK include it in their packages. You can also buy mobile broadband dongles in the outlets. 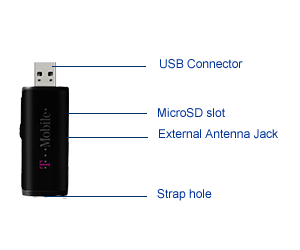 Dongle should be kept inserted in the USB when you are using mobile broadband. 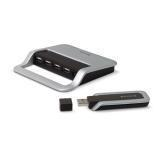 If your laptop or PC have all ports used, then, you can use a USB hub. This is a box type device which has a few USB slots which you can use for plugging your dongle. No, they are broadband jargons referring the same device. The speeds depend up on the mobile broadband providers and the packages. Most mobile broadband dongles are high speed modems as long the package speeds and 3G broadband coverage support them. Mobile broadband dongles (offered by most UK mobile ISPs) support Windows XP, Vistas and MAC OS X Panther 10.3.9 or higher. However, check this feature on the website of your mobile broadband provider or contact their customer support, before sign up. Vodafone, T-Mobile, Three (3), O2 Mobile, BT and Orange Mobile offer dongles bundled into their mobile broadband packages. It may sound free, however, you need to sign a contract for 24 months or so and this will help the providers to adjust the cost of dongle offered to you initially. If you do not want sign a contract and go for Pay and Go (PAYG) service, you would pay for the dongle surely. Yes, dongle can be used when you travel outside the UK. However, you need to pay roaming charges when you use mobile broadband dongle abroad. Roaming charges will also change depending on the countries where dongle is used. You can get more information on roaming charges by contacting your provider. Should I have to buy new dongle when I switch my mobile broadband providers? Unfortunately, you cannot use the dongle supplied by the previous provider with the new service you would like to subscripbe. This is because, when you buy a dongle with a specific provider, it usually comes with pre-configured settings that would work only with that provider. So, you will need to buy a new dongle when you go for new service. How to install my mobile internet dongle? No matter who provides you mobile broadband (whether it is 3 or T-mobile or Vodafone or BT), the following guide is useful for all users, as the installation doesn’t vary much, except that you would see different Licence Agreement with each provider. 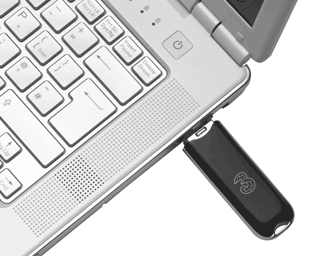 To use mobile broadband dongle, you should have a computer with a USB port. With laptops, this is not an issue. However, if you use old PCs, check to see wheter it has a USB port. First insert the dongle into the USB slot of your PC or laptop. Most desk top PCs or laptops should have a couple of USB slots or more. When you insert the dongle into the computer, do it gently, making sure that you do not insert incorrectly. Once your dongle is plugged, the computer would soon detect it and you would see a series of dialogue boxes. An installShield Wizard would soon appear and you would be asked to follow the instructions. Sometimes you may need to use an installation CD to install the required drivers for the dongle. Within a few minutes, your USB broadband modem (dongle) will be connected to mobile broadband internet. The software that comes with your broadband package is helpful in monitoring your usage and 3G signal strength. Check to see you have plugged the USB dongle (modem) correctly. If the dongle is not fitted properly, it would not be detected by the Operating System. Sometimes, the USB port might be faulty or did not detect the dongle for some reason. If so, insert the dongle into another USB slot. Make sure that SIM is properly inserted into the dongle. For help, refer your user manual when you re-insert the SIM card. Check to see whether any firwall or anti-virus or any other software prevents the USB modem stick from connecting to internet. Check the operating system version in your computer. Most mobile broadband dongles would work fine in Windows 2000/XP/Vista, or OS X for an Apple Mac. However, dongles may not work in older versions of these OS platforms. You may also experience problems with connecting to mobile internet, when you are in a marginal or no coverage area. If the problem persists, you’d better contact your provider. Check to see that the browser settings are correct. You would need to use the proper settings in Internet Options like LAN settings to access mobile internet. Changing the browser may sometimes work. Check to see whether any firewall or anti-virus or any other software conflicts with mobile connectivity. If so, disable that software temporarily or change the settings and try connecting to internet. If you use pre-paid or Pay As You Go mobile broadband, check whether you have enough credit on your account. Can I improve the speed of my dongle? Location, indoor structures and weather conditions affect mobile broadband performance. If you use your dongle in indoors, choose a place where you can get better signals, for example near the windows. handy, portable units are compatible with Huawei broadband dongles that the UK mobile providers offer. 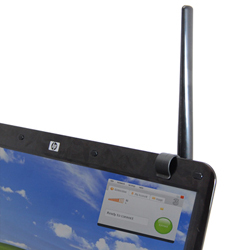 The unit can be attached to the laptop screen with a clip. To connect the antenna, just plug it into your dongle using a cable and connector. Mobile broadband antennas indeed boost the data transfer speeds, however, if you live in areas where your ISP provides poor coverage, they may not work as well as you expect. Use the USB cable instead of directly plugging the dongle into your laptop. This method enhances signal strength.